The formaldehyde content of at least 11 brands of hair straighteners exceeds 1 percent. Customers’ scalps may be coated with these solutions for at least 30 minutes, but, since workplace laws cover only employees, consumer exposure to formaldehyde is unregulated. But salon workers are protected under federal law, and Occupational Safety and Health Administration has signaled its intention to enforce workplace formaldehyde safety limits in its April 11, 2011, Hazard Alert to salons (OSHA 2011). New OSHA salon tests have detected formaldehyde vapor levels exceeding federal standards (OSHA 2011). Tests by state health agencies and companies have detected significant vapor levels in salons using Brazilian Blowout, Cadiveu and Trichovedic hair straighteners (OOSHA 2010, Brazilian Blowout 2010A, Cadiveu 2010A, Trichovedic 2011). Test air, train employees and install showers and eye wash stations. When formaldehyde exposures reach those indicated in published salon air tests, federal workplace standards mandate a broad range of actions to protect stylists and other salon workers from this hazardous gas. How can a salon owner or employee find out how much formaldehyde vapor is in the air? A salon owner can contact the state occupational safety and health agency for recommended, qualified private laboratories. 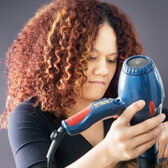 How do you learn how much formaldehyde is in your salon’s hair straightener brand? Salon owners or employees may not get a straight answer when they ask manufacturers about their hair straightening products’ formaldehyde content. EWG’s investigation has found that many companies give out misleading information about formaldehyde in their products. Look up your product in EWG’s database to learn if it has been tested. If not, we recommend you submit the product for testing at any private laboratory that can run EPA Method 8315. EWG recommends air testing even if you don’t find formaldehyde in products, since some non-formaldehyde formulations release it when they are heated. What are common symptoms of formaldehyde exposure? What can a salon employee do about health problems from formaldehyde? Owners are required to test salon air if an employee reports symptoms. An owner must notify employees within 15 days of receiving results. Employees can report reactions and other adverse health effects to the state occupational safety and health agency and can request to remain anonymous. The agency will follow up with the employer. How do I know if my salon is following the regulations? The table below details federal formaldehyde regulations and lists the chance your salon exceeds the relevant limits based on all published salon air tests. Your state may have additional workplace standards for formaldehyde. Prompt exposure testing (air tests) for workers reporting symptoms. Notification of employees of air testing results within 15 days of receipt. Regular visual inspection of products to detect leaks. Storage area and warning labels for areas used to ventilate, clean, or store contaminated equipment. * Based on calculated 8-hour averages using the sample data from 11 salons. Each successive treatment was assumed to emit formaldehyde at the same level and for the same duration as was measured for a single treatment. Salon workers and their clients typically inhale formaldehyde vapor for a full 90-minute process. A client might undergo the service just once every 12 weeks. But an efficient stylist might handle two or three sessions a day, multiple days a week. The stylist’s exposures to formaldehyde fumes could be intense, long-lasting and frequent. Formaldehyde vapors peak when hair is heated. Typically, a salon worker blow-dries and straightens every section of hair multiple times with a flat iron heated to 450 degrees. Many federal agencies have issued recommendations for maximum formaldehyde exposure. These include the Department of Homeland Security, Consumer Product Safety Commission, Department of Transportation, Environmental Protection Agency, Food and Drug Administration, Department of Housing and Urban Development, Mine Safety and Health Administration, Occupational Safety and Health Administration, American Conference of Industrial Hygienists and National Institute for Occupational Safety and Health (NTP 2010). Only those regulations issued by OSHA carry the force of law. They are less restrictive than all other agencies’ health-based guidance, which are strictly voluntary. Source: EWG compilation of test results (Brazilian Blowout 2010A, Cadiveu 2010A, Oregon OSHA 2010B, Trichovedic 2011A, Trichovedic 2011B).